The House on Wednesday passed 347-70 a major overhaul to veterans health care, voting to expand their access to private sector care on the government’s dime and to bring the Veterans Affairs Department through a process that would close some of its federally run facilities. The Veterans Affairs Maintaining Internal Systems and Strengthening Integrated Outside Networks (MISSION) Act won widespread support in the lower chamber and will now head to the Senate, where it already has bipartisan backing. The massive bill dealing with multiple areas that have for years proven to be political landmines moved quickly through the House, with House Veterans' Affairs Committee Chairman Rep. Phil Roe, R-Tenn., introducing the bill just one month ago. 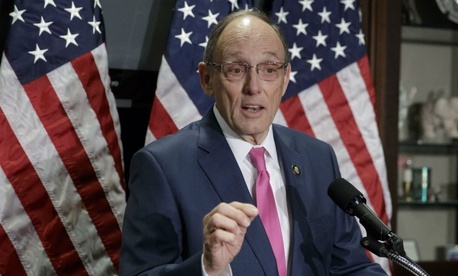 Roe had worked for much of the 115th Congress with Democrats, his counterparts in the Senate, the Trump administration and an array of veterans stakeholders to reach a compromise bill. The measure this week also won the official backing of the White House, which put out a statement saying the bill would “strengthen the VA’s ability to deliver timely, high-quality healthcare in its own facilities, while ensuring seamless integration with community care providers.” President Trump personally praised the bill in a tweet, saying the Senate should act within the next two weeks. House votes today on Choice/MISSION Act. Who will stand with our Great Vets, caregivers, and Veterans Service Organizations? Must get Choice passed by Memorial Day! The Choice Program, which Congress established after the 2014 scandal involving department employees manipulating patient data to hide long wait times, is set to run out of funding later this month or in early June. The bill would avoid that pending crisis by providing $5.2 billion for the program before sunsetting it permanently in one year. The bill overall would cost $52 billion over five years, according to the Congressional Budget Office. A spokeswoman for Sen. Johnny Isaskon, R-Ga., who chairs the Senate Veterans' Affairs Committee and has praised the VA MISSION Act, said Senate Majority Leader Mitch McConnell, R-Ky., would determine when the bill received floor time but the hope was for it to move “quickly.” A McConnell spokeswoman said no vote has yet been scheduled. The American Federation of Government Employees, which represents 230,000 VA employees, has called on Congress to reject the measure, saying it would endanger the department by shifting resources toward the private sector.